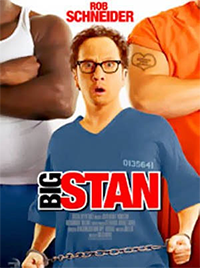 A few days ago I saw Rob Schneider promoting the DVD release of Big Stan on Chelsea Lately and with no real expectations set out to watch the prison comedy. Being a prison comedy I did expect a few laughs but was pleasantly surprised that it did make me chuckle more than I expected. What surprised me even more was that the action scenes were very decent – even interesting. Big Stan may not have made it to the big screen but it is actually enjoyable enough to watch on DVD. Big Stan is about a con artist who, when he found out that he was going to prison, prepares by learning martial arts. Stan (Rob Schneider) is trained by “The Master” (David Carradine). When he arrives in prison he immediately sets out to make a reputation for himself and eventually becomes the big man in prison. He teaches fellow prisoners to co-exist in peace and thwarts the plans of the corrupt warden (Scott Wilson) to produce a bloody riot. Though definitely not a deep movie it is worth watching if you are in the mood for something light-hearted. Rob Schneider’s attempt in action is also commendable with the scenes believable enough yet still managing to retain the humorous side each time. So if you’re looking for a few belly laughs this weekend go buy Big Stan settle down for an hour and a half of laughs. Yes , a good comedy , i like it!